Bethany, my new phone monkey, came to live with us and her friend Zoe this week. She's the perfect size for both my phone and my camera, now I'm not sure which is best suited for her! I'm leaning towards the camera, as I really care more about protecting that than the phone (don't tell my phone I said that). In these pictures she's hanging out with one of my one-of-a-kind handbags, available for sale on Etsy or at Ditto Kiddo. 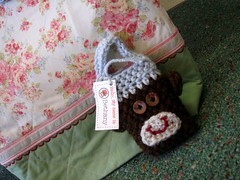 Bethany, like Zoe, was created by Ginny at isew.biz. In other news ... the new sewing machine is a dream. A dream. I had no idea how bad the other one was until I started using the new one. It's as smooth as butter, while the other one was as smooth as velcro. I've got a few quilts in the making, and a bunch of unfinished projects from when the old machine died. Using a foot pedal is taking some getting used to, I keep sitting down and looking for the button to start sewing ... and then, finally, duh, I realize I need to put my foot down. I think though that I prefer the foot pedal, I've got much more control than I used to have. I miss having an automatic thread cutter but am having no problem getting used to cutting the threads myself. I can't wait to finish a few things and share some pictures! What a pretty bag, Bethany looks great with it! 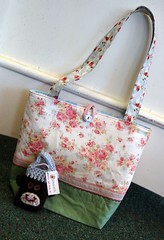 Thanks for mentioning me and my shop, I'm so glad you like the monkeys. Keep those photos coming.